By: Erik Hyrkas on March 26, 2014. Hosting review site Review Signal just unveiled a staggering analysis of WordPress-included hosting options on the web. Of eight different hosts offering WordPress as a CMS in a hosting plan, GoDaddy was found to rank over all of them for best performance and value for cost. With WordPress hosting nearly 19% of the entire Internet, Review Signal took it as a challenge to see who was really worth the dime for consumer-friendly (out-of-the-box CMS) hosting options. “Many companies in the managed WordPress space are charging a very high premium over the traditional shared web hosting providers. So beyond the marketing speak, what are you really getting,” asked Kevin Ohashi, Review Signal CEO and author of the report released Wednesday. Hosts in the lengthy analysis included: A Small Orange, Digital Ocean, Go Daddy, Pagely, Pressable, SiteGround, WebSynthesis, and WPEngine. 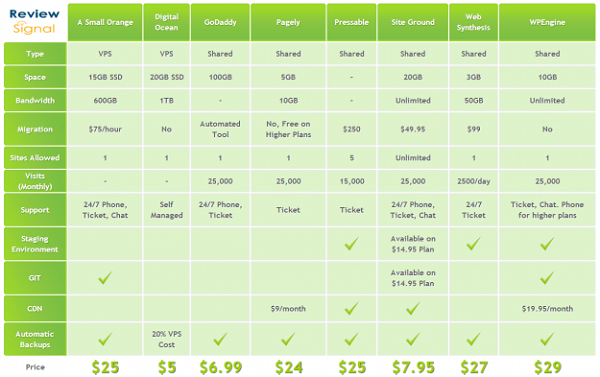 In ReviewSignal’s chart above, you can plainly see Site Ground and GoDaddy offer the most storage, bandwidth and support options for the lowest costs. Other hosts such as WPEngine and Web Synthesis cost as much as $29 a month for basic shared hosting plans, not including hefty migration fees or costs for site-staging environments. Nevertheless, in tests Digital Ocean, the cheapest of the available turn-key WP hosting options (at $5/mo), failed tremendously. However, the analysis notes that Digital Ocean is also not in the same niche of the rest of these companies, as their servers are better used by web experts because Digital Ocean will not assist users in WordPress management. Of the numerous tests of speed, consistency and errors while holding sizable traffic from around the world, GoDaddy was deemed the most reliable despite some issues. “GoDaddy, despite their small hiccups, managed to have the best average response time to 8 servers distributed across 5 continents (Virginia, Oregon, California, Singapore, Japan, Brazil, Australia, Ireland). Furthermore, they also managed to serve the most hits,” wrote Ohashi. In addition, SiteGround ($7.95/mo) had the slowest average response and lowest hits/second, but did not have a single error or timeout; the response was consistent throughout the test. Of the more pricey options, A Small Orange ranked closest behind the domain name giant GoDaddy. “A Small Orange’s performance was stunningly consistent. The fastest response was 238ms and the slowest was 244ms, a difference of 6ms over nearly 24,000 requests. They were just barely behind GoDaddy in hits and average response,” wrote Ohashi. In the end, Review Signal’s tests preach that in this “out-of-the-box” WordPress host niche, not all competitors are rated equal. In fact, the lower cost alternatives performed so much better than the premium plans offering close to the same support, that Ohashi suggested GoDaddy could continue to price gouge its competitors. “Overall, I would say GoDaddy delivered on their claim, performance wise. They appear to be in the top tier of specialized WordPress hosting companies. Given their price, I think they have the potential to push down pricing on most of their competitors who charge 3-4 times what GoDaddy charges,” concluded Ohashi. Last updated by Erik Hyrkas at January 13, 2016 .